It employed thousands, had a workers' village with its own police station, and used more than 500-miles of pipe work in its construction. A special exhibition to mark the UK's first large-scale oil refinery is now on display at the National Waterfront Museum in Swansea. Down to The Last Drop: Oil and Llandarcy, explores the history of the Skewen-based site. It looks at how oil was produced, but also at village life. 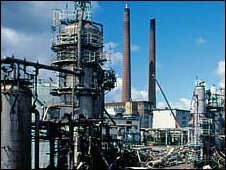 The refinery was built on boggy woodland and waste ground in Coedffranc, a hamlet near Skewen. Building work began in 1918 and the site opened in 1922. Originally, it had been associated with the medieval Neath Abbey and workers later told stories of ghostly monks haunting the refinery. By 1960 over 8 million tons of crude oil were refined at Llandarcy every year. Once a year all the gardens were inspected by the BP Horticultural Society to ensure that they were being kept up to standard. Llandarcy fielded three teams in both rugby and football and five in cricket. Touring international teams from South Africa, Australia, New Zealand, Canada and Ireland trained there. The original development cost £3m and covered more than 650 acres. William Knox D'Arcy founded the company that was to become British Petroleum and, although he died five years before the refinery opened, Llandarcy was named in his honour. Oil from Iran was the first commercially-exploited source in the Middle East. Some oil was refined locally, but much of it was shipped 6000 miles to Wales. The museum's curator for modern and contemporary industry Ian Smith said, "This site was immense. It was the first major oil refinery in the UK to process crude oil and they went on to make all sorts of things - it was vast. "They built a village for the workers, which was like a closed community, and they had another village for management." The houses were built in different styles in an effort to make it look like a community which had grown up naturally. A farm supplied food to the local shop, which was also run by a village committee. Local people could also rent an allotment to grow their own vegetables. At the heart of life was the Community Hall, known as the institute, which was used for evening classes, meetings and social events. There was an annual sports day on the green, children's parties were held at Whitsun and Christmas in the hall, and dances were often staged in the evenings. As part of the exhibition, visitors will have the opportunity to read personal memories. Jeff Wiltshire worked at Llandarcy. He said, "The Village Institute was the village centre. "I remember the Whitsun Tea and Sports Day with the high jump, sack races and the marathon - once round the roads in the village. "As the village was owned by BP and was private, they used to lock the village to outside traffic on those days for safety." 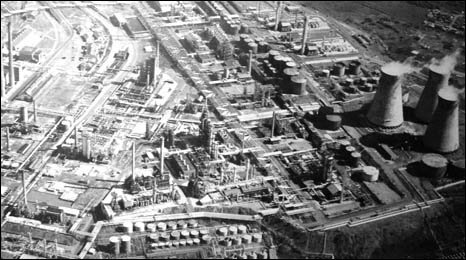 In the 1950s the refinery was a major employer in south west Wales, with more than 2,600 men and women working there. A new dock, Queen's Dock, was specially built at Swansea, already a thriving port and the oil was piped from the huge tankers docked there to Llandarcy. In 1961 a new oil terminal was built at Angle Bay, Pembrokeshire. The deeper waters of Milford Haven were better suited to the enormous ocean-going tankers. A pipeline carried the crude oil across South West Wales to Llandarcy. The site went through various stages of growth and decline before finally closing in 1997.